Lunchtime, and the kids were off with their respective sets of friends. 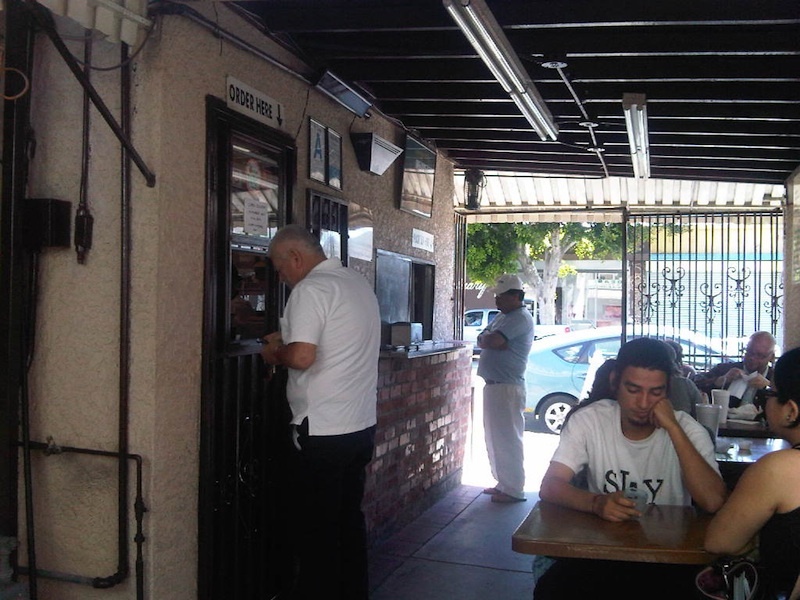 With nothing to do but the dishes or work, I did what any self-respecting writer would do: I got in my car and drove to East L.A. for a burrito. Specifically, the green chili and cheese burrito from Al & Bea’s. Now, while it’s true that I don’t consider myself a foodie because I don’t care about the “it” restaurant or rush to try things like bull’s pizzle soup like The Minty has been known to do, I will go miles out of my way for a promising burrito. So would anyone born and raised in Southern California. Burritos and tacos (but more burritos) are our comfort food. Which is why it was most passing strange that here in East L.A., I had my local girl status questioned. For the first time in my life. Here in Boyle Heights. Where my own great-grandmother, (by way of Ireland, of course) lies buried to this day! ¡Ay, Dios mio! I ordered my burrito and sat down on a shady bench to wait for them to call my number. There was a gal sitting across from me, Asian-Americanish, with short, Popsicle-colored hair. We smiled at each other. Oh God no. Bright? I spent 20 years dressed almost entirely in black, and only recently have come to embrace a wider color palette, such as autumnal tones and certain shades of pink. And now look what’s happened. I present like an out-of-towner? That’s what I get for washing my jeans for the first time in weeks. Since when am I blonde? And since when is blonde not L.A. anyway? Didn’t we invent the blonde? But and anyway, I’m NOT a blonde, certainly not in the L.A./Hollywood sense of the word. Really she just could have come out and said I’m a little too caucasian for these parts (which I’m not, for the record), and I would have felt less insulted. I tried not to glower. I really did. Just then they called my number. In glorious Español. I grabbed it and split. Back on the freeway, back down home, blaring the Nine Inch Nails the whole way. Sorry lady. I didn’t have any BEACH BOYS. I fell on it con mucho gusto. And washed it down with a nice cold jamaica agua fresca. 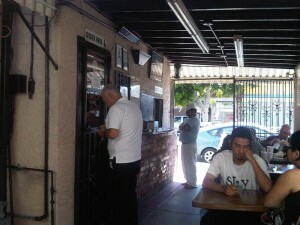 Was it the “best burrito in Los Angeles?” It ranked in the top five. But I didn’t feel it was the best I’d ever eaten. In truth I have to give it more research. Next time, I’ll bring the nits. Neither one of them is a blond. And I’ll make sure and wear something black. Ha! If you take me with you the next time you have a hankering for a burrito, they wouldn’t ask you where you’re from! Oh…the reputation I’ve garnered by having bull’s pizzle. Take me with you next time! I wanna try a top 5 burrito -and nobody can ever guess where I’m from! In fact, when people wonder where I’m “from” they usually mean, “which country”. I’m in for East L.A.! I wouldn’t worry about it. It sounds like she was picking up on the fact that you’re just a lot more THERE than anyone else. Not to say that you’re a total Lucy, but next to you, most people are definitely Ethel Mertzes. Or maybe I’m just projecting. My office is filled with mid-twenties demi-personalities who have all the flavor and zest of overcooked hamburger. what a totally weird interaction. Ay my amor! I just came back from 3 mos. in Mexico and I have to say that I A) am Mexican-American (no, I mean it, literally. I have dual citizenship), B) speak Spanish fluently, C) wear the brightest colors under the sun (altho I,too, often go long between jean washings), D)was born in L.A., raised in Long Beach. I swear, I would have just stared at that chick. But then again, I look Mexican with my dark brown-grey streaked hair, dark brown eyes and somewhat of a tan right now. sighing. Geez, take me next time for some street cred, or on 2nd thought, a wing-man for back-talking people like that. Why would you care what anyone at the Burrito stand thought anyway?